Three years after 2015's Kintsugi, Seattle's Death Cab for Cutie are releasing their first album as a quintet, Thank You for Today. Founding guitarist/producer Chris Walla left the band following the recording of Kintsugi and didn't tour that album, but Thank You for Today sees touring guitarists/keyboardists Dave Depper and Zac Rae become official fulltime members (joining founding singer/guitarist Ben Gibbard, founding bassist Nick Harmer, and longtime drummer Jason McGerr). These transitions may give some fans the idea that their lovable indie rock group will be heading in a new direction. However, while Thank You for Today indeed shows progress and maturation, it never loses any of the signatures that make the songs uniquely Death Cab for Cutie, with moments in the record harkening back to Narrow Stairs, Plans, and The Photo Album. The record opens with "I Dreamt We Spoke Again," a song that delivers haunted piano chords with McGerr's tight drumming and Gibbard's narrator talking about an imagined reconnection with a former lover in which his "mind filled in the blanks." This trancelike vibe of the record continues for the first few songs until the Yoko Ono-sampled opening of lead single, "Gold Rush." Here, Gibbard takes the listener on a tour of his Seattle neighborhood, all the while wryly commenting on the tech giants who constantly "dig for gold" to pad their own bottom lines. 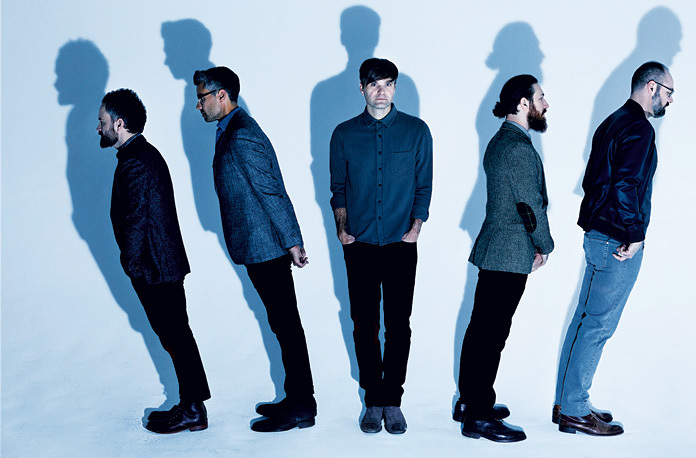 Musically, Death Cab for Cutie do use a variety of keyboards and synths throughout the album, but there are plenty of electric guitar dirges (especially in songs such as "Your Hurricane") to satisfy the palates of long-time fans. Song titles like "Summer Years" and "Autumn Love" seem to build on a subtle theme about the passage of time and the changes that occur, whether you want them or not. Formed at Western Washington University in 1997, Death Cab for Cutie developed their fan base among similarly aged music lovers before being catapulted into the spotlight as Adam Brody's favorite band on the FOX teen drama, The OC, signing to a major label and being the centerpiece of every mix CD you ever gave or received in the mid-to-late 2000s. The albums that followed led the group to experiment, albeit with some misses. Thank You for Today may strike a chord with fans in particular, not only because of the fact that Death Cab for Cutie has incorporated some familiar musical elements, but also because of the fact the fans have grown up with the band in a way. Each of the band members have found love, lost love, and found it again. They've experienced the birth of children and the death of loved ones. And the humanity and gratitude of being alive is what shines through. Under the Radar spoke with Gibbard about the inspiration behind their ninth record, writing and recording without Walla, the changing nature of Seattle, and his experience in the ultra-marathon world. Chris K. Davidson (Under the Radar): The title of last album, Kintsugi, was inspired by the Japanese art concept of fixing broken pottery and trying to make something beautiful out of the wreckage. This new record title, Thank You for Today, seems at least a bit more optimistic. What's changed for you and the band in general over the last few years? Ben Gibbard: At first, we started by saying [the phrase "thank you for today"] to each other during the making of the record initially in a jokey, false sincerity...the way you say something in a jokey way so that you don't appear vulnerable. We had certain days in the studio where we'd say it in complete earnestness or we'd have bad days and say to each other: "thanks a lot for today, man." It's not really a concept record, none of the records have ever been concept records, but I think the things that tie the songs together I feel are a function of my age now. I'm 41, so I'm a middle-aged man. If I'm lucky, I'm in the middle of my life, and there's a lot of looking backwards and forwards. It's a point of no return, so to speak. You're right in between the decisions you've made in your life and most likely will be with you the rest of your life. When one is right in the middle, the focus on staying present in the moment is much more acute than I've known in my life to date. I think the title is an apt marker of specifically where I am in my life, just trying to be more present and grateful for the time that I have here. You're working with Rich Costey again for this album. How did he challenge and push you all this time around? Even before we knew Dave and Zac were going to be members of the band and actually be in the studio (we already had a hunch about their tenure though), we had made a decision that we needed to make another record with Rich, especially given the transition with Walla leaving the band. We wanted a creative constant. We wanted Rich to be there to say, "Hey man, this isn't good enough. You wouldn't have done this last time." In our initial conversations, we expressed that to him. We told him it had been a joy to work with him, and that we needed a little less subjectivity than we're bound to have [working by ourselves]. What was the process like without Chris? Did you feel like you had any pressure from yourselves or fans? Most of the records that we've done, with the exception of maybe the first album, I'd bring in songs in varying levels of completion. Sometimes, it would have a drum part, a bass part and a guitar part, and Chris would add whatever he was going to add to it. Sometimes he would mimic some type of melodic intonation that I would have already brought to it, but more times than not, he would do his own thing. I think over time I leaned on him to do that. When I was writing songs, I would think to myself, "Well, I don't need to finish this part. Chris will write something for it." But for this record, because we didn't know how things were going to go with Dave and Zac, I felt I needed to do more work on the front end to really complete the songs, so at least we have a place to get back to in the arrangements. More songs than not had a bass part, a keyboard part, a second guitar part. There were more songs that were complete since the first record. That's not to say every demo sounds like the song on the album. Certainly, Dave and Zac, once got into the process, brought an unbelievably big bag of creativity and skill set to the recording studio. I just wanted to make sure I had covered all my bases on the writing end. I never was really thinking about it from a fan's perspective outside the fact that I'm our band's biggest fan. I think as I look at our catalogue over the last five years, I see some places where we ended up in some territory that was getting us away from what made us who we were. With any career artist, you look at their catalogue and you have the records in the middle that go astray and hopefully those artists get back on track. As I looked at all of our songs, I realized that all the songs that our fans like are the songs that I like the most. So, I realized if I tried to think about the music from that perspective and really try to settle into what I want the record to do, I think we can transcend the loss of Chris not being in the band anymore. And to be perfectly clear, Chris is not a replaceable musician. He is not a replaceable part of this band. We never thought of it as just getting some new people to make it how it always was. Chris Walla's legacy in this band is such a massive part of why the band has had its success in the past. But having said that, we would be nowhere if we didn't have songs that connected to our audience. I think our records have always lived and died on the quality of the songwriting. And there are records where I've written better songs than other songs. Lord knows there's been times when Chris has had to polish a turd. The best production in the world is not going to save a bad song. I felt confident that as long as we had a good collection of songs that we could make a really good record with or without Chris. There are definitely a few moments on this new album that felt like a callback to records like Narrow Stairs. Yeah, that was intentional. I wanted to bring a lot of the songs back into some voicings that I've always enjoyed with this band. Certain guitar work, vocal styles, I wanted to get back to a place that would take the last 20 years of this band—the steps forward and the steps back-and focus on what we do best. The first single released for the record, "Gold Rush," talks about the changes you've seen in your neighborhood in Seattle over the last 20 years. Every city is in a state of flux and change, that's just the nature of cities. What's been happening in Seattle is this rapid growth and development that's highly accelerated, and it's due in large part to the tech boom in Seattle. With the rise of Amazon and the tech companies comes Google and Facebook. All the other companies come into the area. They're like the pile of fish that swim to where the shark is. It's changed the dynamic of the city in a profound way. The city of Seattle that I moved to 20 years ago was a city you could afford to work some kind of service job and still pay rent and be in a band or make art or do whatever you were doing creatively; not to mention just being a working-class person. This city is slowly becoming a playground for the rich, very much like New York or San Francisco. That's upsetting to me. One option is to stomp up and down and talk about "back in my day." I wanted to write a song that dealt with my emotions about the situation that was not necessarily "get off my lawn." To me, the song could take place anywhere insofar as someone can listen to the song and recognize how when the landscape around us changes, you have to reckon with the passage of time and the people who have been in your life. For me, the song has to do with the changes that have happened to myself. Amazon and Facebook haven't done anything to me. I have, as I say in the song, "placed faith in geography." I've done this to myself by placing my memories in the buildings and landscapes. The intro to "Gold Rush" has a musical sample from Yoko Ono's "Mind Train." How did that come about? I'm just a huge fan of hers in general. If there's a crusade that I've been on over the last 10 years or so, it's been trying to convince the people around me to do an actual dive on her music and not fall prey to the racist and sexist narratives of her involvement with The Beatles. There's a depth of songwriting that exists on Approximately Infinite Universe and Feeling the Space. Thankfully, Secretly Canadian rereleased those records a couple of years ago, so people can actually hear them, but for years they were out of print. I just always loved the groove of that song "Mind Train" and was listening to it and suddenly thought "I should flip that." So, I threw it into the computer and cut it up and made a sample out of it. I had never met her, but she gave us her blessing and approval to use it, so that was really meaningful to me. I have to admit, the intro sounded a bit like Beck's "Loser" to me when I first casually listened to it. When we were putting the song together, it was coming out kind of Beta Band-ish, kind of '90s. Our impression was that there will be some people who are going to hear it and who are not going to like the song at first. But I think it's one of those things that sticks in your ear and maybe grows on people who aren't initially into it. I think people who are concerned that we've gone in some drastic new direction based on the single will be really surprised when they hear the whole album. This album has a lot of directional and seasonal language, which is not the first time you've done this, especially in the past with a song like "Summer Skin." Is there a particular reason you used titles like "Summer Years," "Autumn Love," and "Northern Lights?" That's never really been a conscious choice. I've always liked the seasons as metaphors. "Summer Skin" is like the tan and how your skin absorbs the summer. "Summer Years" is more like a metaphor for life. You can't double back to the summer, you can't double back to those years where you were in your prime. Summer, winter, spring, fall, they're strong rhymes and the fact that they're not more than two syllables, they work so well in lyrics. I think I may have tapped them out on this album. I think we've used all the seasons at this point. Two albums ago [Codes and Keys], you ended the record with the song "Stay Young, Go Dancing." This time around, the album ends with a song called "60 & Punk." Is there a significance to that change besides turning 40 a couple of years ago? That song is for someone in my life who was one of my idols and heroes growing up. I was a witness to some very unfortunate events that made me very sad about how this individual's addiction had taken over their life, and I was seeing just the nature of hero worship. When you're a kid and you want to be a musician, you look at musicians who are your heroes and think that because they're on that stage or on MTV, that they've got it all figured out, that getting to that peak influence is going to fulfill one's life. As anyone who has gotten to a place where they've been trying to get to in their career or life, you realize that while you're grateful for all that you've been able to accomplish, real life takes up much more of your time than the thing you've been chasing. Along the way, you make mistakes, people get left behind, affectations become addictions. To see someone who I admire so much now on the back nine of their life and their career and to see how one's demons could catch up to them was very sad to see, but very humanizing. So, in the song, I wanted to set the scene of a superhero with no one to save anymore. The life that we lead as artists—and not to sound too Behind the Music—has a very real and all-encompassing darkness that can overwhelm people. I wanted a song that humanized that experience and asked the question of "were you happier when you were poor?" Were you happier when you were starting out? Is the anticipation of the journey greater than the journey itself? In our lives, we experience that in smaller ways. We look forward to our vacations for months and months. We talk about [the vacation], how great it's going to be. Then, you're on the vacation and it's a good time, but it's never going to live up to the anticipation of the vacation when you're sitting at your desk and can't wait to get out of there. Death Cab for Cutie has been around for over 20 years now, but over the last 10 years, you've gotten sober and found a new interest in ultra-marathon and trail running. Looking back, what would you say are your biggest accomplishments now compared to what you might have said in 2008 if asked a similar question? There are so many parallels for me between the journey to finishing an album and the journey to finishing a 100-mile trail race. There's so much preparation. There's so much work that goes into it. There are small successes and failures along the way. To put it in slightly hokey terms, they're both very unique and somewhat related journeys. In my experiences running 100-mile races and ultra-marathons, there are going to be times where you are going to feel terrible. There are going to be times where you think there is no way you'll be able to finish. You just want to quit. I've had totally similar experiences making albums. There are times where I think that we're making the greatest record ever made and people are going to go crazy over it, and then there are moments when you go home and think you're a fraud and that you're making the worst album ever made. It's a similar emotional roller coaster. I've always been someone who's so destination-focused that I've had difficulties with the journey in general during my life. What ultra-marathons have taught me is to be present in the journey. Since I've started the practice in my life, ultra-running to me has been like a spiritual practice. Some may roll their eyes, but it is like a religion of sorts. People can meditate, people can do psychedelics, and people ultra-run. There's a level of mental and physical transcendence that happens in running 100 miles. It's an unbelievable experience. It's not for everybody. I don't think I'm a better person because I do it, by any stretch of the imagination, but I've felt its influence in the creative process. It helps you realize that today may have been a bad day, but you've got tomorrow. Or I'm not really writing anything good right now, but that doesn't mean I'll never write again. It doesn't mean I'm out of songs. It just means that, for right now, it's not happening. It hasn't made me a better songwriter, but it certainly has given me some perspective that I needed in my life.